Tag line: "A Show Boat Load of Laughter!" Another April has arrived, meaning baseball season is once again upon us! And to celebrate, I decided to throw a baseball-themed film into the mix. As I was perusing a list of movies that feature America’s pastime, The Naughty Nineties popped out at me. When we were teenagers, my brother and I spent hours poring over The Baseball Encyclopedia, a humongous book that offered stats and standings for every player and team, dating all the way back to the 1870’s. From what we could gather, the 1890’s was a fascinating period in the sport’s history. Not only did superstars Honus Wagner and Cy Young begin their careers in this decade, but the Philadelphia Phillies, our hometown team, had what writer Bill James called “The greatest outfield of the 19th century”: future Hall-of-Famers Sam Thompson, Billy Hamilton, and Ed Delahanty, a trio of excellent hitters (in 1894, all three finished the season with batting averages over .400). The fact that The Naughty Nineties is an Abbott and Costello comedy didn’t deter me in the least; this was a movie I simply had to see. 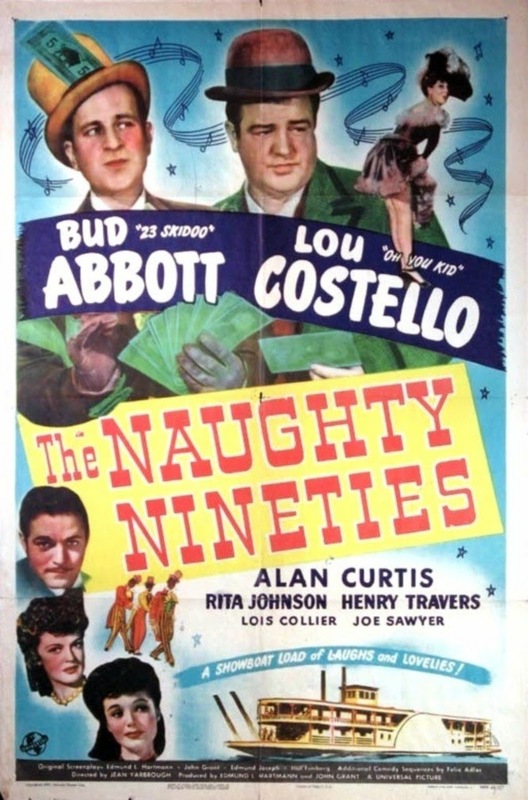 Released in 1945, The Naughty Nineties has Bud and Lou starring as Dexter Broadhurst and Sebastian Dimwiddle, a couple of stage actors working on The River Queen, a showboat that cruises up and down the Mississippi. During a stopover in the town of Ironville, the ship’s Captain (and owner), Sam (Henry Travers), meets three shady gamblers; Crawford (Alan Curtis), Bonita (Rita Johnson), and Bailey (Joe Sawyer), who invite him to a card game. Seeing as the Captain once had a gambling problem, Dexter and Sebastian do their best to keep an eye on him, but to no avail. By the time the game is over, the three gamblers are co-owners of The River Queen, and immediately transform it into a floating casino. With the help of Captain Sam’s daughter, Caroline (Lois Collier), Dexter and Sebastian look for a way to get rid of the gamblers, hoping to once again turn The River Queen into a steamship the entire family can enjoy. From this synopsis, it’s pretty obvious that Abbott and Costello’s The Naughty Nineties is not a baseball movie. It does, however, contain a sequence every fan of the sport should be familiar with: the duo’s famous “Who’s on First?” routine, a baseball-themed comedy sketch in which new catcher Lou asks coach Bud the names of the other players on the team. I could sit here and try to describe the incredibly witty exchange (“Who’s on first?” “Yes” “I mean the fellow’s name” “Who”), but it would lose so much in the translation. If you haven’t seen “Who’s on First?”, you owe it to yourself to do so immediately. Even without “Who’s on First?”, The Naughty Nineties is a decent flick, with Bud and Lou teaming up for plenty of laughs (a scene where Lou bakes a cake filled with feathers is particularly good). Yet as funny as the rest of the movie is, it’s “Who’s on First?” that makes it memorable, not to mention worthy of being listed alongside Field of Dreams, Pride of the Yankees, Eight Men Out, and every other baseball film ever produced. The Baseball Hall of Fame in Cooperstown, New York, obviously agrees; for years, the museum has been playing this scene from The Naughty Nineties on a continual basis, giving the sport’s youngest fans, many of whom have never heard of Abbott and Costello, a chance to experience what is easily one of comedy’s most entertaining routines. What's not to love about Abbott & Costello? I'm looking forward to seeing this film.